Open the Properties window and navigate to the “Object” properties. 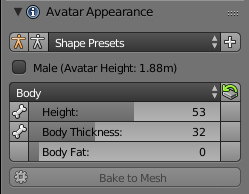 There you find a panel “Avatar Shape”. Avastar-1.6: Avatar Appearance Panel has been redesigned and is also available in the Toolshelf. Height: The current height of the character in online world units (1.87 meters in this example, note that Avatars tend to be slightly bigger than real world people). Section: A popup Menu for the different Shape Sections. This is equal to the Shape Editor in SL or OpenSim. Male: A Gender selector. By default the gender is female. If you check the selector, the Avastar character changes to male. You can switch the gender at any time. Some sliders have a small stickman icon on their left side. This indicates the slider affects the bones (bone sliders). Note: The Reset icon on the Top Left resets the entire Bone Section to its Default Values. 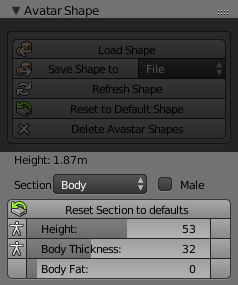 Before Avastar-1.5: click on the Reset default icons to get back the slider’s default value. 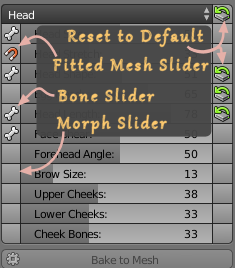 We have added 2 extra sections Changed, and Skeleton which do not appear in the Second Life Shape editor. The Changed section is empty by default and will be populated by the list of changed Shape sliders of your Avastar. The Skeleton section (see image) contains all sliders which will change the bone length of the Avastar character. If a slider has been changed then you will see a reset icon right to the slider. Clicking on that icon will reset the slider to its default value. Note: The Mesh Deformer project has been abandonned in Second Life. However it is used in OpenSim and some other virtual worlds. Therefore we have not removed the support for the Mesh Deformer.